Aligarh, April 14 (PTI): Prime Minister Narendra Modi on Sunday hailed the contribution of Bhimrao Ambedkar on his birth anniversary, saying it is the strength of the Constitution given by him that people from humble backgrounds are holding post of president, vice-president and PM. 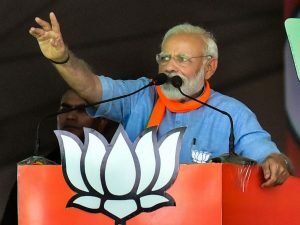 In the last three days “you must have noticed that how a competition to hurl abuses towards the chowkidar is going on,” Modi said. “The artists of the ‘mahamilawat (adulterated alliance)’ have unleashed (themselves) on Modi. After all, what happened in the past 2-3 days? Actually, after the first phase of polling, their survival chances are very slim, and they know this very well. In fact they are now standing at the brink of defeat,” he said.